In the comments of my Silverlight 4 EdgeCam Shots blog post "marcb" asked me how to convert the WriteableBitmap to a byte array to save the snapshot in a database. I thought the answer might be also useful for others. Furthermore I will provide ready to use code for JPEG encoding and decoding of the WriteableBitmap. I will include the two methods in my WriteableBitmap extensions that I'm going to put up on Codeplex soon. If you want to store many images or transport them over a network the needed storage size could quickly become a big problem. For example an image with the size 512 x 512 needs 1 Megabyte storage space and a 1024 x 768 image even 3 MB. A solution could be image compression using JPEG encoding and decoding. 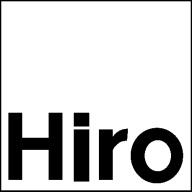 To accomplish this I've used the open source FJCore JPEG library which is distributed under the MIT License and works nicely with Silverlight. Keep in mind that the standard JPEG format doesn't support alpha values (transparency) and that the compression is lossy. So don't encode and decode images subsequently with JPEG. It is also possible to use the built-in Silverlight class BitmapSource and its SetSource method to decode an JPEG stream. Check out my Codeplex project WriteableBitmapEx for an up to date version of the byte array conversion methods. 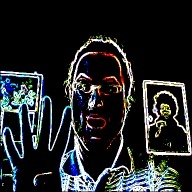 In my last blog post I have covered the new Silverlight 4 Webcam API and provided a demo that used my edge detection pixel shader to create a nice real time webcam effect. In this post I make an extended version available which can save webcam snapshots as JPEG files and I also discuss some limitations of the webcam API's built-in CaptureSource.AsyncCaptureImage snapshot method. Furthermore I will give some ideas on how to build a Silverlight 4 video chat / conference application on top of the provided JPEG capturing and encoding code. To view the application you need to install the Silverlight 4 runtime. It's available for Windows and Mac. The Webcam capturing could be started and stopped with the "Start Capture" Button. If you press it for the first time you need to give your permission for the capturing. This application uses the default Silverlight capture device. You can specify the video and audio devices that are used by default with the Silverlight Configuration. Just press the right mouse button over the application, click "Silverlight" in the context menu and select the new "Webcam / Mic" tab to set them. Press the "Save Snapshot" Button to take a snapshot and save it to a JPEG file on your harddisk. The threshold of the edge detection can be changed using the Slider and the "Bypass" Checkbox allows you to disable the shader. The base Silverlight 4 webcam usage code was covered in my last blog post. The code is pretty obvious: A SaveFileDialog is shown and if the user enters a file name and hits OK, a stream to the file will be opened and passed to the SaveSnapshot method. There's only one think to keep in mind when using the SaveFileDialog.ShowDialog() method, it can only be called from user-initiated code like an event handler, otherwise a SecurityException is thrown. The Rectangle's surrounding Grid "ViewportHost" is rendered into a WriteableBitmap and the WriteableBitmap's Pixels are copied into another buffer with a different format. The rendered image is then written as a JPEG encoded stream using the open source FJCore library which is distributed under the MIT License. I've found some code at Stackoverflow on how to use the library in combination with the WriteableBitmap, but I modified / shortened it. See my post on how to Convert, Encode And Decode Silverlight WriteableBitmap Data if you are interested in more WriteableBitmap conversion and JPEG encoding code. You might be wondering why I haven't used the Silverlight 4 webcam API's built-in AsyncCaptureImage snapshot method of the CaptureSource class. 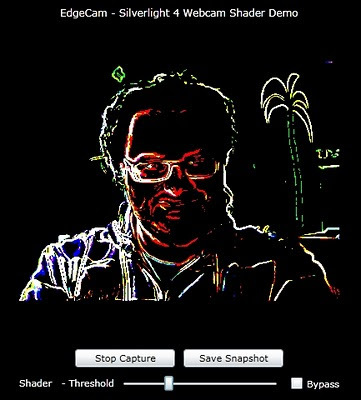 The AsyncCaptureImage method grabs a frame directly from the device and therefore any effects like the edge detection pixel shader won't be visible in the rendered image. It only works if the CaptureSource was started, so the user can't save the visible image when the capturing was stopped. See the MSDN for details. Please keep in mind that the first beta version of Silverlight 4 was used for this blog post and that some things will be changed in subsequent releases. The code in the SaveSnapshot method could be optimized and also multithreaded. The rendering should run in it's own thread. The encoding in a separate thread too and the network transport also. This approach would utilize modern quad core CPUs. After that it might be a good starting point for a video chat / conferencing application that continuously renders JPEGs and transports them between Silverlight clients. 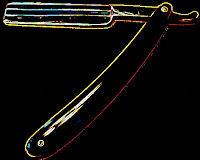 This technique is similar to the M-JPEG video format that also uses separately compressed JPEGs. To make this idea usable for a Silverlight video chat, only the rendering, the JPEG encoder and the transfer method need to be fast enough for real time streaming. Please leave a comment what you think about it. Download the Visual Studio 2010 solution here. 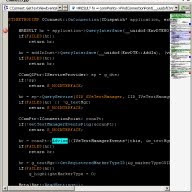 Only 4 months after Silverlight 3 RTM came out Microsoft released the first beta version of Silverlight 4 on 11-18-2009 at the PDC. The new features are just awesome and many of them were requested by the community. Tim Heuer's great blog post covers all the new goodies in detail and provides videos and source code for most of them. 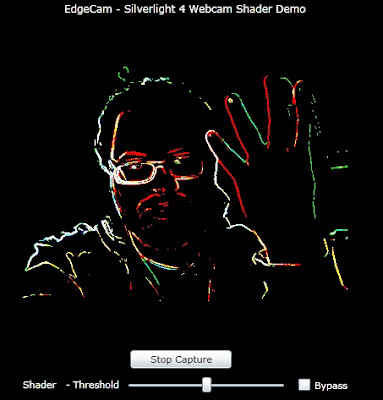 One of my favorite new features is the webcam and microphone support and I've coded a small demo that uses the new Silverlight 4 CaptureSource class and applied my edge detection pixel shader to it to create a cool real time webcam effect. To view the application you need to install the Silverlight 4 runtime. It's available for Windows and Mac. You can also watch a video below. The Webcam capturing could be started and stopped with the Button in the middle. If you press it for the first time you need to give your permission for the capturing. This application uses the default Silverlight capture device. You can specify the video and audio devices that are used by default with the Silverlight Configuration. Just press the right mouse button over the application, click "Silverlight" in the context menu and select the new "Webcam / Mic" tab to set them. 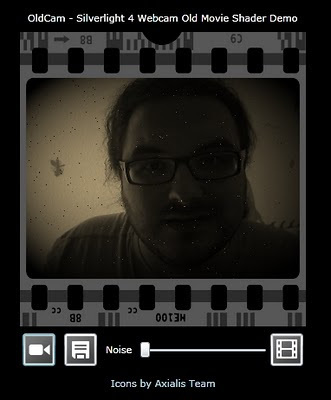 I've recorded a short video with my iPhone 3GS that shows the demo running on my Samsung NC 10 Atom Netbook. The built-in webcam is not very good and the video was recorded at night, but I think it's good enough to see how the effect looks. 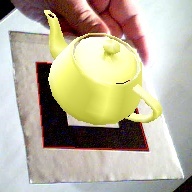 The edge detection pixel shader is applied to the "Viewport" Rectangle in the XAML. For a more intuitive behavior I've also attached a negative ScaleTransform to flip the x axis of the Rectangle. Otherwise the webcam output would be mirror-reversed by default. 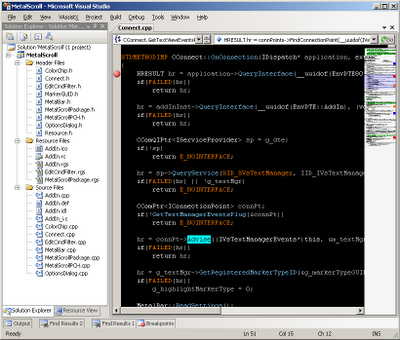 The Visual Studio 2010 solution including the edge detection shader is available for download. Last week I've released the second part of my WriteableBitmap extensions methods. I've added DrawLine() methods and presented a sample application that showed that the WriteableBitmap line-drawing methods are 20-30 times faster than the UIElement Line class. A stable and fast line-drawing algorithm is the basis for most shapes like triangles, rectangles or polylines in general. For this blog post I've extended the WriteableBitmap with some specialized methods for various shapes including a fast ellipse rasterization algorithm. The application includes various scenarios where different shapes are drawn. By default a little demo is shown that I call "Breathing Flower". Basically different sized circles rotating around a center ring are generated. The animation is done using the best trigonometric functions in the world: sine and cosine. The scenario "Static: WriteableBitmap Draw* Shapes" presents all shape extensions currently available. 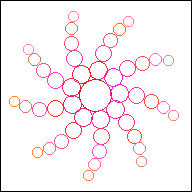 From left to right: Points - SetPixel(), Line - DrawLine(), Triangle - DrawTriangle(), Quad - DrawQuad(), Rectangle - DrawRectangle(), Polyline - DrawPolyline(), closed Polyline - DrawPolyline(), Ellipse - DrawEllipse(), Circle - DrawEllipseCentered(). The other two scenes randomly draw all shapes or only ellipses and allow controlling the work load by setting the number of shapes. The Silverlight frame rate counter at the upper left side shows the current FPS in the left-most column. Most of the new extension methods use the DrawLine() function to build up a shape. Only the DrawRectangle() method implements a simplified line drawing using some for loops which is faster than calling the DrawLine() method four times. The DrawEllipse() function implements a generalized form of the Midpoint circle algorithm. I've used "A Fast Bresenham Type Algorithm For Drawing Ellipses" from this paper by John Kennedy. The DrawPolyline() method uses an array of x- and y-coordinate pairs and the array is interpreted as (x1, y1, x2, y2, ..., xn, yn). If a closed polyline should be drawn, the first point must also be added at the end of the array. The DrawTriangle() and DrawQuad() methods needs all shape points as x- and y-coordinates. 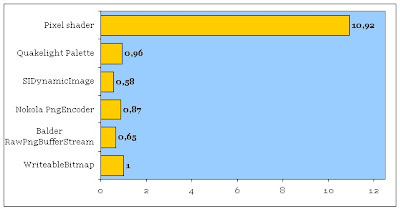 The DrawRectangle() function plots a rectangle out of the points that represent the minimum and maximum of the shape. The DrawEllipse() method interprets the parameters the same way, but the DrawEllipseCentered() function takes the center of the ellipse and the radii as arguments. All methods are available for the Color structure or an integer value as color. You can download the Silverlight application's source code including the complete and documented ready-to-use WriteableBitmapExtensions file from here. Check out my Codeplex project WriteableBitmapEx for an up to date version of the extension methods. For the next part of this series I'm planning to add fill extensions methods to the WriteableBitmap like FillRectangle(), FillEllipse(), etc. Nokola optimized the DrawLine() function a bit and made it 15-30% faster than the standard DDA implementation. I've replaced the DrawLine() method in the extensions with Nokola's optimized version, fixed some bugs and updated the source code. The original DDA implementation is now called DrawLineDDA(). Nokola optimized the DrawRectangle() function and I've updated the implementation of it. I've also added a faster Clear() method without parameters that fills every pixel with a transparent color. This was also proposed by Nokola. The WriteableBitmap class is a nice feature that was added in Silverlight 3. It could be used to generate fast procedural images by drawing directly to a bitmap. The WriteableBitmap API is very minimalistic and there's only the raw Pixels array for such operations. 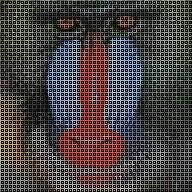 This Property stores a 32 bit integer as color value for each pixel of the WriteableBitmap. A couple of months ago I've written a handful of SetPixel methods that made it easier to use the WriteableBitmap, but they only provided a better interface for the Pixels Property and had no real functionality. This time I've written a more algorithmic method which performs a rasterization of a line: The famous DrawLine(). As the name implies is it used to draw a line between two points in the bitmap. To say it in advance: This is the way for drawing huge amounts of lines in Silverlight. I've used the elegant C# 3.0 extension methods again to add this functionality to the existing WriteableBitmap class. The application includes various scenarios where line-drawing is performed and it is also possible to set the number of lines to control the work load. The Silverlight frame rate counter at the upper left side shows the current FPS in the left-most column. You can find some details about the other parameters in this excellent blog post by András Velvárt(@vbandi). For comparison I've also added a randomized line drawing scenario using the UIElement Line. I've implemented two common line-drawing algorithms: The well-known Bresenham algorithm that uses only cheap integer arithmetic and a Digital Differential Analyzer (DDA) which is based upon floating point arithmetic. I don't want to explain the algorithmic details that were already explained several times in the literature or on the web. The linked Wikipedia articles are a good starting point if you are interested. The default DrawLine() method uses a DDA algorithm and is available for the Color structure and an integer value as line color. Furthermore it needs the x and y coordinate of the start point (x1, y1) and the end point (x2, y2) of the line. I have also added a Clear() method that fills the whole WriteableBitmap with a Color. The WriteableBitmap line-drawing approach is more than 20-30 times faster as UIElement Line. So if you need to draw many lines and don't need anti-aliasing or other UIELement properties, the DrawLine() extensions methods are the right choice. One interesting fact: The Bresenham algorithm that uses only simple integer operations is not the fastest line-drawing algorithm anymore. It was one of the earliest computer graphics algorithms invented in the 1960s. Since then the hardware has changed dramatically and a simple floating point DDA technique gives almost the same results on modern hardware. Please keep in mind that these results may differ depending on the used hardware. You can download the sample application as a Visual Studio 2008 solution including the complete and documented ready-to-use WriteableBitmapExtensions class from here. Check out my Codeplex project WriteableBitmapEx for an up to date version of the extension methods. I'm planning to write more shape extensions for the WriteableBitmap like DrawRectangle(), DrawEllipse(), DrawPolyline(), etc. I will publish them in follow-up blog posts. Silverlight Live Streaming being discontinued. What now? The Microsoft Live team announced in a blog post that the Silverlight Streaming service is being discontinued. The Silverlight Streaming service offered free hosting for Silverlight applications and videos. "Microsoft Silverlight Streaming by Windows Live Beta is being discontinued and will eventually be taken down. A new Windows® Azure(TM)-based hosting and delivery service will be launched by the end of 2009, though this is not a direct replacement for Silverlight Streaming and will have costs associated with its use." Effective immediately, no new sign-ups are permitted for the Silverlight Streaming service. In addition, the Silverlight Streaming publishing plug-in for Expression Encoder will no longer be available for download. The new Windows Azure functionality will not be a direct replacement for the Silverlight Streaming service and will be a paid subscription service." The blog post also gives some instructions on how to retrieve the hosted Silverlight content. One can't really say that the offered (Azure) "migration process" is comfortable and frictionless. Actually, as far as I know there is no real Azure migration service at the moment, one can only access the Silverlight Streaming file system and copy the content. In my opinion this is not a very nice move of Microsoft for bloggers like me. I have used Silverlight Streaming to provide live examples for my Silverlight posts. I mainly blog about Silverlight development and provide content and source code for free, therefore I help Microsoft to spread their technology - for free. It's a shame that a free streaming service at least for personal / educational purposes like mine isn't offered anymore. I might see things too naive and got the intention of Silverlight Streaming wrong, but from my point of view it's definitely not nice. For now I have uploaded the samples and Videos to my public Dropbox folder and stream them from there. Dropbox uses Amazon's S3 storage system to store files. Timothy Parez (@delegatevoid) pointed me on this alternative and it actually works fine. Thanks Timothy! One great addition to Silverlight 3 are pixel shaders. The Blur and the Drop Shadow shaders are bundled with Silverlight 3, but it's also possible to attach custom shaders to any UI Element. Unfortunately shaders are not executed on the GPU by Silverlight, but the Software implementation is pretty fast. There are many cool effects, which are not already part of the WPF Pixel Shader Effects Library, one could implement. So only the sky is the limit - and the Shader Model 2.0 instruction count limit of course. Silverlight pixel shaders could be written in HLSL and compiled with the DirectX shader compiler fxc. The produced binary file is then loaded with the Silverlight 3 PixelShader class. Quite easy huh? I must admit that I'm not a complete newbie to shader development. I even wrote some shaders with Shader Model 1.1 in the assembler shading language a few years ago, but haven't done it a while. 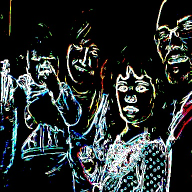 For Silverlight 3 I've implemented an edge detection post processing effect. 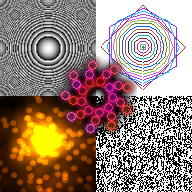 It's a parametric pixel shader, which performs a common image processing technique called convolution. The initial image "Lenna" is a famous test picture for image processing algorithms. Daniel Collin (@daniel_collin) pointed me on the interesting story behind that picture of Lena Söderberg. Although Lena is a pretty lady, you should try another image too. 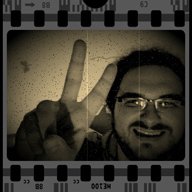 You can control the threshold of the edge detection with the Slider and disable the shader with the "Bypass" CheckBox. Select one of three preset convolution operators from the ComboBox: Scharr, Prewitt and the well-known Sobel operator. It's also possible to change the first column of the Gx convolution kernel to try your own operator. Actually two 3x3 convolution kernels are used by the algorithm. One for the horizontal (Gx) and another one for the vertical (Gy) direction. The Gy is just a 90° rotation of Gx and the last column of Gx is the inverse of the first column. The middle column is zero. So instead of 18 parameters (3x3x2) only 3 parameters need to be passed to the shader. I used the Shazzam Tool for the shader development. It's a nice tool to write and test shaders for WPF. It also generates a corresponding class for the pixel shader, which is then used in XAML. Most of the controls take advantage of Silverlight's 3 great (Element) Data binding mechanism. 0); // Alpha is always 1! The colors of the current pixel's neighbors are sampled from the image, which are then multiplied with the corresponding kernel value. The results are summed up, the threshold is applied and the new color is returned. I optimized the operation a bit more by calculating some static variables, using the squared threshold and leaving the calculation for the zero kernel column / row out. The Visual Studio 2008 solution including the pixel shader is available from here. 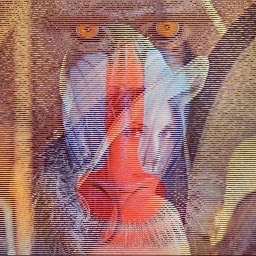 Having a fast dynamic bitmap generation API at hand is essential for procedural image generation and a lot of computer games. Therefore many Silverlight developers were disappointed that WPFs WriteableBitmap wasn't available before Silverlight 3. 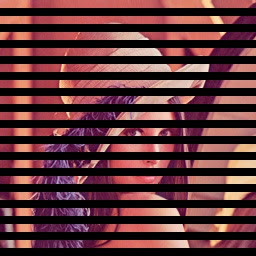 Fortunately there was the BitmapImage.SetSource method, which uses a Stream as parameter for the bitmap source and could be used to fill an Image. I think Joe Stegman was the first who wrote a custom PNG Genertor Stream, which used this Stream mechanism and made it possible to generate procedural images with Silverlight 2. Other implementations followed. Now that we have Silverlight 3 and the WriteableBitmap class, all these custom PNG Stream implementations became obsolete. There are still some developers, who complain about the performance of the WriteableBitmap. I was curious how the custom PNG Stream implementations compete with the WriteableBitmap and how big the speed difference really is. That's why I wrote a small Silverlight 3 application, which measures the frames per second of the custom PNG Stream implementations and the Silverlight 3 WriteableBitmap. RawPngBufferStream from the open source GameEngine Balder, which I used for my Perlin Noise sample. If the tests complete very fast, you should increase the "Maximum Frames" to get right results. The Image has the size 512 x 512. One after another every drawing method is executed and the time is measured. The method CalculateColor(int x, int y) computes the color for every pixel. 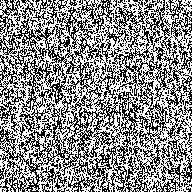 For that I implemented a nice old school demoscene effect, which produces an interference image. I was inspired by the brilliant Amiga demo State of the Art from 1992. 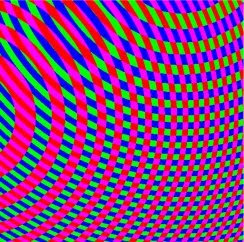 // Nice sine circle movement. 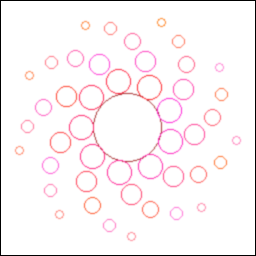 The circles center position is animated with a sine function. For better performance I use a pre calculated lookup table (LUT) here. The rings are built using the clamped Euclidian distance to the center. 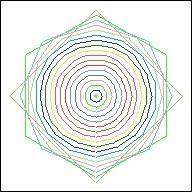 Actually every Math.Sqrt() produces one colored circle, which is cut into rings by the shifting and clamping. 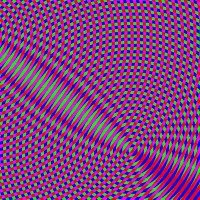 Of course this could also be done with some loops and sine / cosine or other techniques. The square roots are calculated on the fly and not stored in a LUT. Otherwise the calculation would be too fast and not representing a real use case. The rest of the implementation is quite simple and there's not much to explain. If you are interested in the details, please look at the source code or write a comment. The WriteableBitmap is obviously the fastest implementation. Actually I haven't expected anything else, but I hoped it would be a bit faster. Nevertheless, the Silverlight 3 WriteableBitmap is almost twice as fast as the SlDynamicBitmap library and Balder's RawPngBufferStream. Please consider, although I use relative values, you might encounter some slightly different test results. Depending on the used hardware each implementation could perform better or worse. The Visual Studio 2008 solution of the Speedtest application is available for download from here. I've written a follow-up to this article and included the Quakelight PNG implementation and a custom pixel shader.